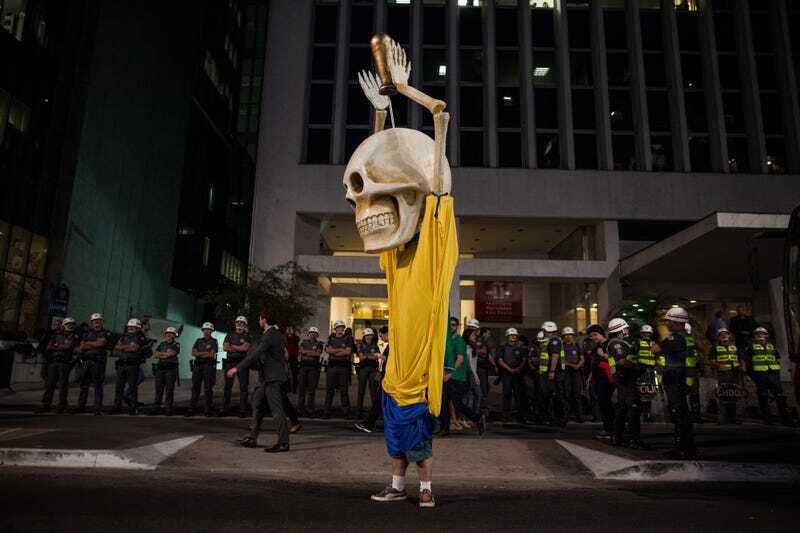 Last Thursday, protestors walked through a business district in São Paulo to oppose construction for the World Cup which has reportedly left at least 4,000 Brazilian families without homes. The march clogged up traffic and shut down shops. There will be more demonstrations—along with public employees striking—as the World Cup draws nearer. Many Brazilians protesting are infuriated at the money splurged on the event, which could have been used towards aiding the impoverished or public services. São Paulo-based street artist Paulo Ito summarized the main problem with a mural of a young boy at a table, crying, with nothing to eat but a soccer ball on his plate. And now, my university's teachers and staff just declared strike starting Tuesday. The silver lining is that it looks like I don't even have to worry about unexcused absences!